Hi! This week I would like to make somethings on my to do list but it was a superbusy week and I couldn't find one minute for me! work work work! I'm working on a new project with SML group (three dear friends of mine), the name of the project is "all you need is ice cream", It's an Italian contest about ice cream design and marketing...I'm so excited! I'll share it with you as soon as we finish it! HOME : I love the drawing on the wall, the colors and the chairs! 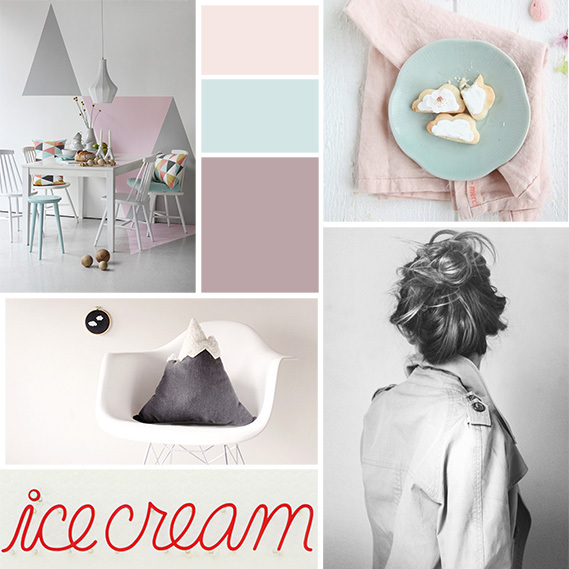 It is a picture from trendenser, a very beautiful Swedish blog about arts, photography, DIY and design. YUM : delicious cloud biscuits with cream. Perfect to celebrate Spring! More photos of these cute biscuits at decor8 blog. DIY : this project is brilliant!! The first time I saw it I was really impressed!A mountain pillow...It's wonderful, isn't it?! The complete tutorial is at Design Sponge web site. This pillow is on my to do list, I hope I will find the time to make it one day!! PHOTOGRAPHY : This is a photo of Emily Africa, a young photographer. I like her photos, they are simple, spontaneous and stylish. OBSESSION : ICE CREAM is my new obsession!I think about the Ice cream project all the day, I'm really having fun making this contest with SML group! I'll write a post about it, I promise! The photos are from Sprinles Ice Cream.